Old acquaintance? The latest member of the ThinkPad T Series, the T530, features one major change from its ThinkPad heritage – a chiclet-style keyboard. Aside from some hardware updates and the implementation of an Intel Ivy Bridge processor, the familiar ThinkPad style and quality have been maintained. 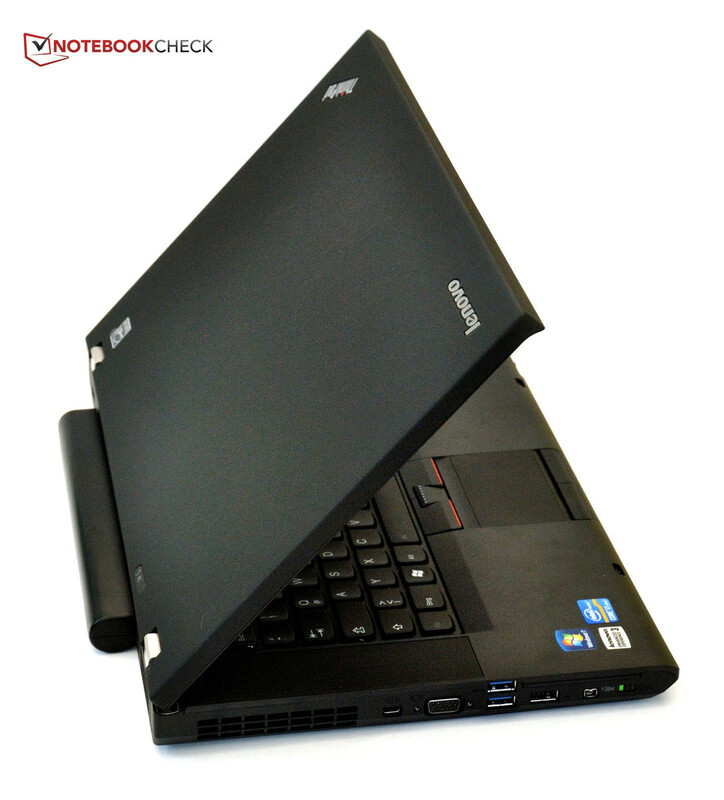 At first glance, the ThinkPad T530 shows no apparent change from its predecessor. The case is very similar and its massive hinges and display latch evoke a certain air of familiarity. The traditional black matte finish is also present and defies scratches and fingerprints. Opening the notebook, however, leads to a surprise. 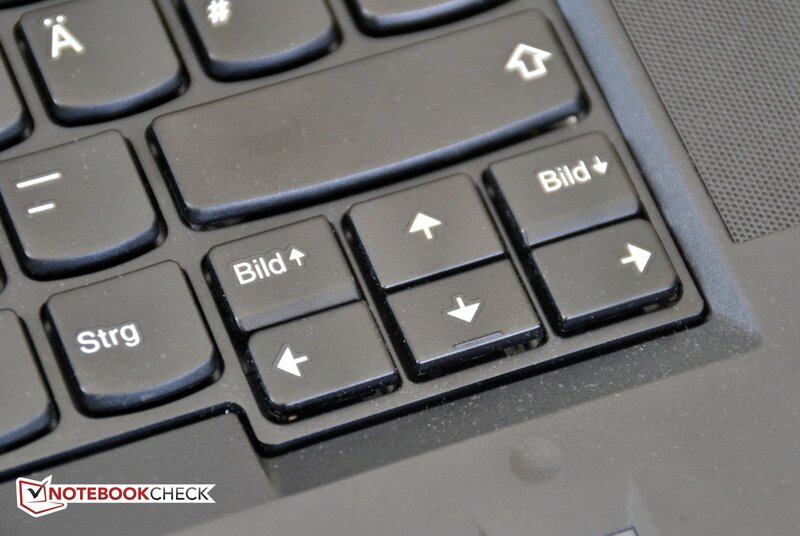 The ThinkPad T530 now features a chiclet-style keyboard and special keys, such as the Enter key, are now black instead of blue. 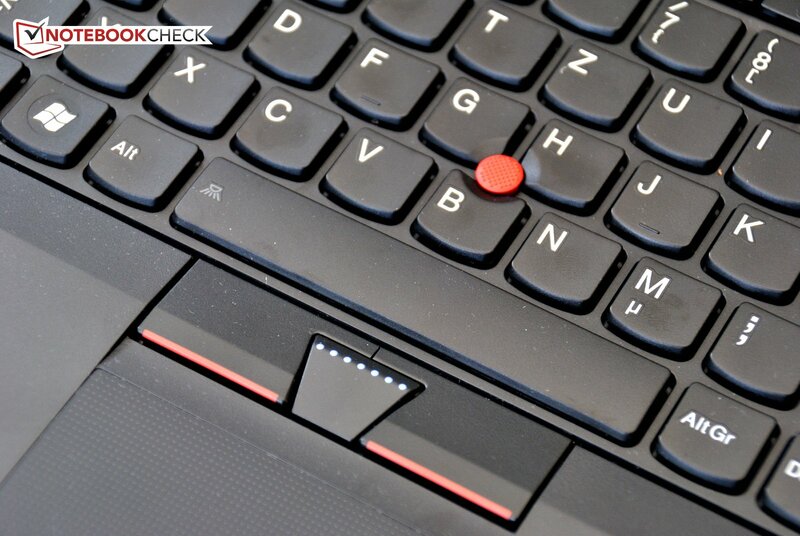 Only the red TrackPoint and corresponding buttons remind the user of the ThinkPad tradition. Apart from the keyboard, the only significant modifications are the internal components. 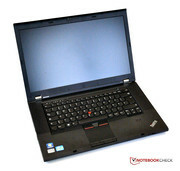 For the T530, Lenovo continues to use familiar ThinkPad features. The base model is available for just under 1000 Euro ($1225 USD). This configuration includes a second-generation Sandy Bridge Core i3 processor, has no dedicated graphics card, and has a 1366x768 WXGA display. The most expensive configuration that includes a Core i7-3720QM processor, Nvidia NVS 5400M graphics card, and a bright Full HD display costs 2500 Euro ($3060 USD). This price quickly inflates to 3700 Euro ($4525 USD) when adding various pre-installed software, an extended warranty, and an additional battery. 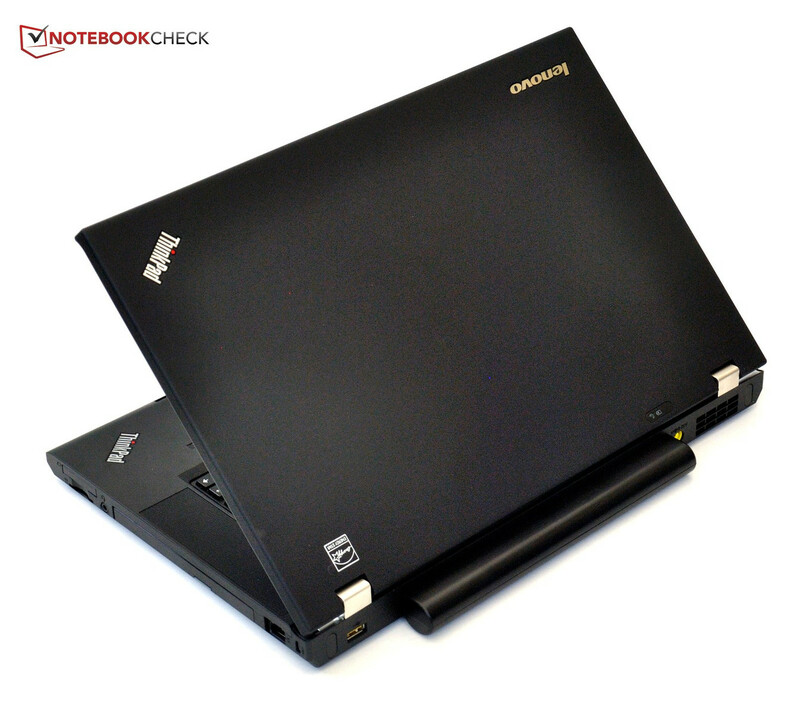 Competing notebooks include the HP EliteBook 8570p and Dell Latitude E6530. As with the Lenovo ThinkPad T530, both balance performance and mobility while maintaining a business-oriented focus. The EliteBook can also be equipped with a more powerful quad-core Core i7-3720QM but uses the AMD Radeon HD 7570M. The Radeon HD 7570M is more or less comparable to the Nvidia NVS 5400M in terms of performance. 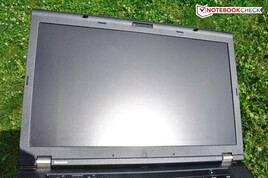 The Dell Latitude uses the weaker Nvidia NVS 5200M. Our test sample features the Intel's Core i7-3520M dual-core processor, Nvidia NVS 5400M dedicated graphics card, 1 GB memory, and a 1600x900 HD+ screen. The price for this configuration is 1500 Euro ($1830 USD). 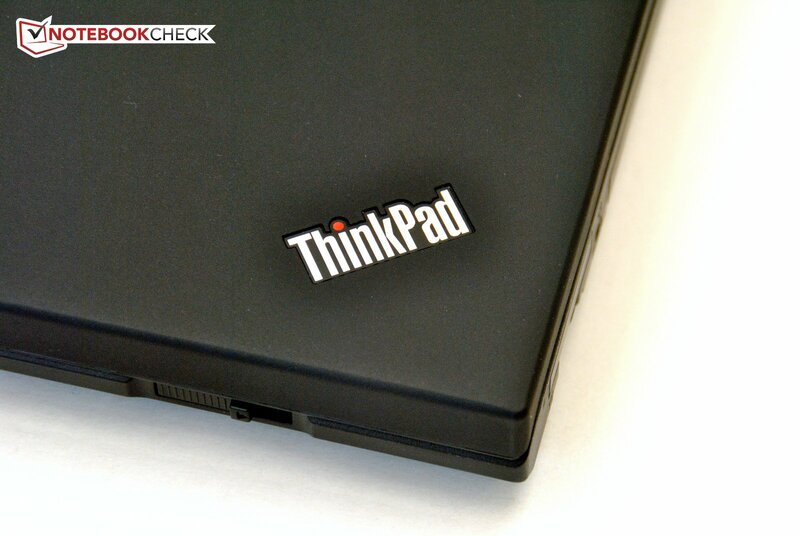 The ThinkPad T530 uses the tried and true traditional ThinkPad case. The only observed differences are the side-mounted ports which have changed a bit. 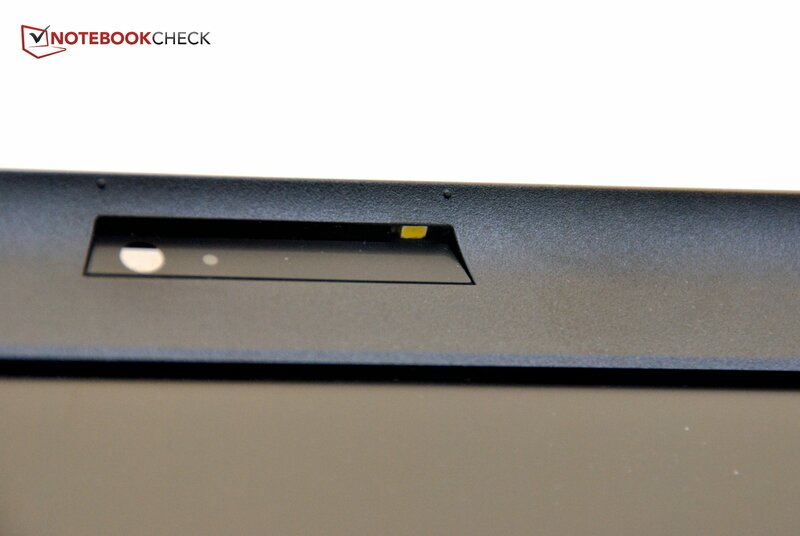 Lenovo still uses a combination of black matte plastic and magnesium as materials for the case. On the other hand, both competing notebooks from Dell and HP use metal cases. The preferred surface material is a matter of personal taste. In terms of stability, the T530 is comparable to its predecessor, the Lenovo ThinkPad T520. Once again, the ThinkPad uses a massive display lid, a latch to secure the display, and the rigid base unit. The wrist rest and area above the optical drive can be marginally depressed but are still significantly superior to most other notebooks. 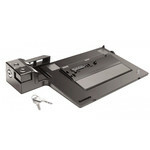 The hinges have a firm grip on the display lid and keep the screen in position. The maximum 180o opening angle is once again present. 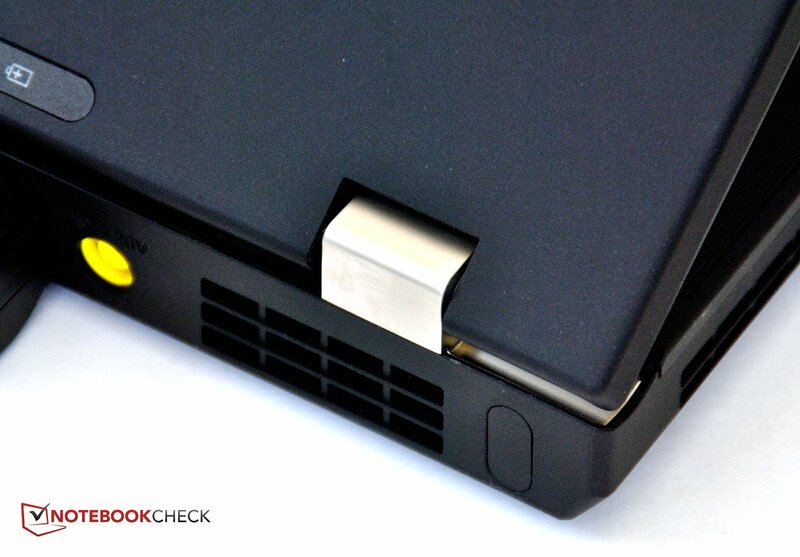 Our major point of complaint for the ThinkPad T530 is the battery latch which we found to be worse than in the previous T520. 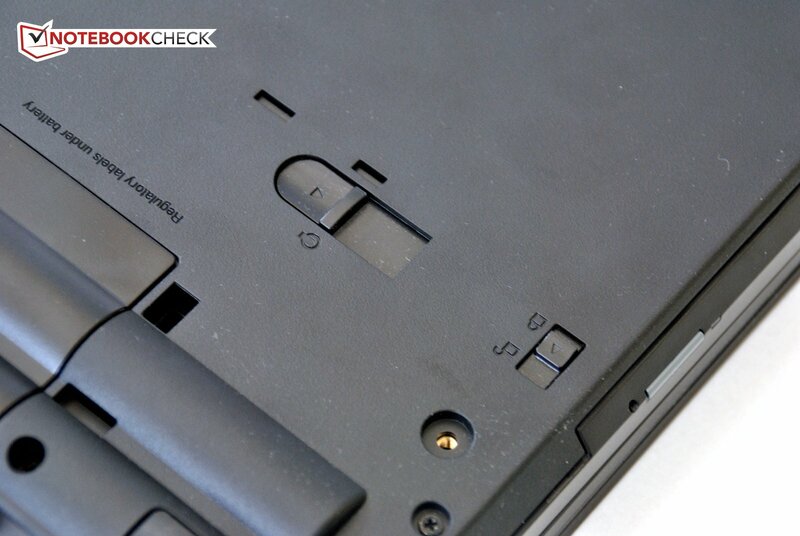 The 9-cell battery protrudes from the rear end, making it a logical place to hold the ThinkPad. 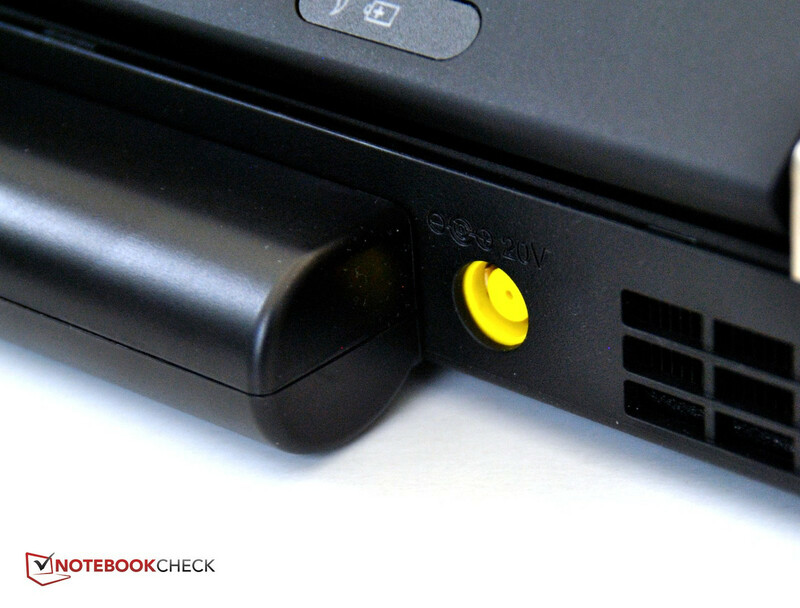 However, in the ThinkPad T530, the battery wobbles a bit, giving one the impression that it may easily detach from the notebook. 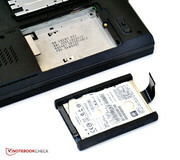 The battery removal latch also feels a bit loose and does not provide clear feedback about when the battery is secured. 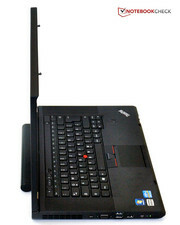 The ThinkPad T530 shows a few slight changes in connectivity. 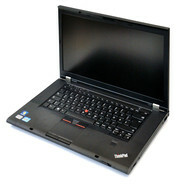 As with the T520, the front is free of ports. 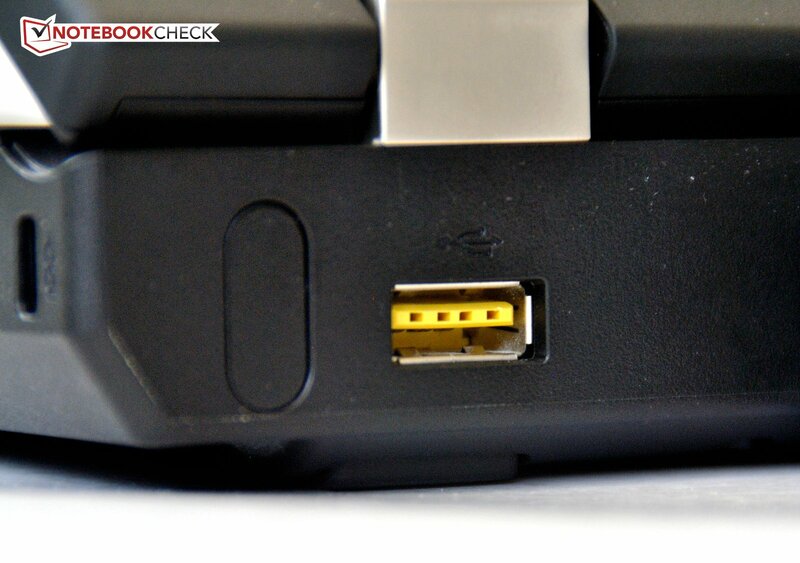 The power port and a single powered USB 2.0 port are located on the rear. 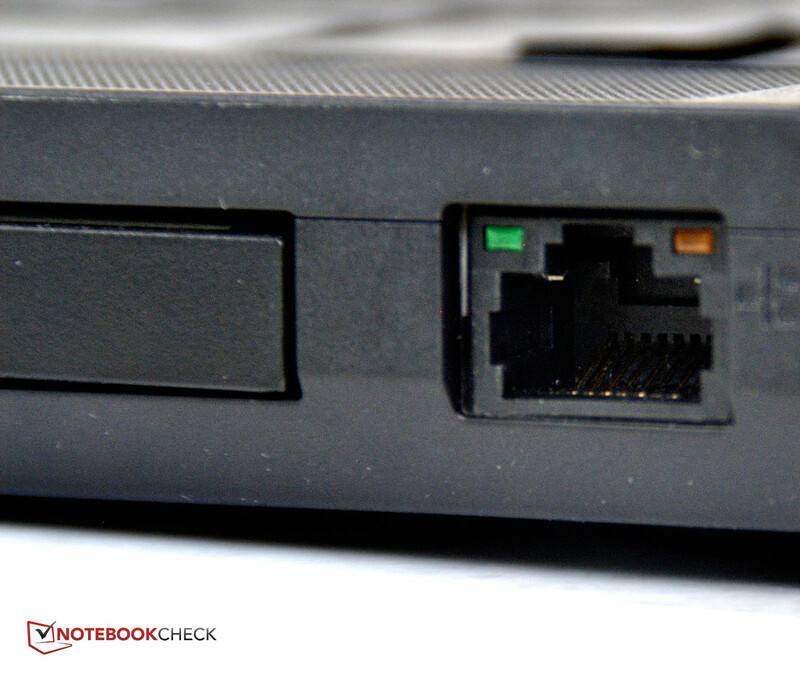 The ThinkPad T530 now lacks a modem port. The right side is identical to the previous ThinkPad T520. 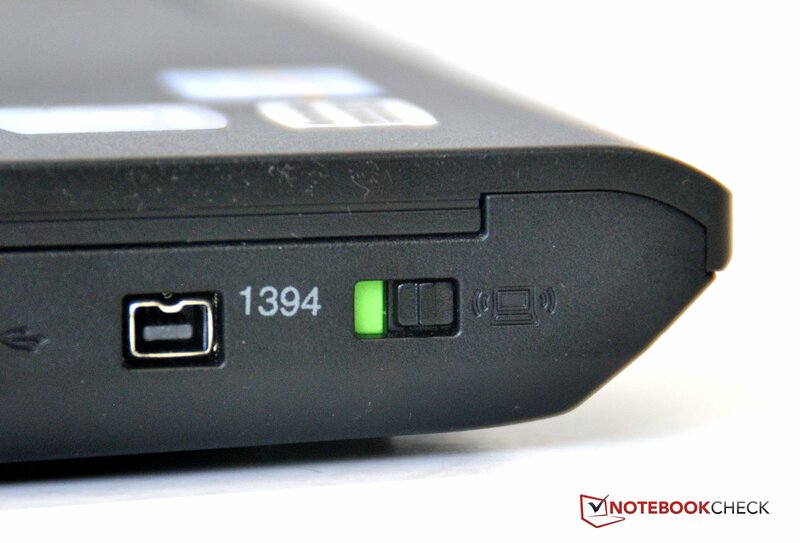 The ExpressCard34 slot and 4-in-1 card reader for SD, SDHC, SDXC, and MMC formats are still found toward the front. A combination audio jack follows. The Gigabit LAN port is located at the rear end of the right side. An ultra-bay slot for an optical drive or second battery takes up the most space and is found between the LAN port and the audio jack. A DVD writer comes standard in the ultra-bay and those who want an additional battery or Blu-ray drive will need to buy these separately. On the left side, a number of changes have been made and everything has been updated. The eSATA/USB combination port has been replaced by a standard USB 2.0 port. 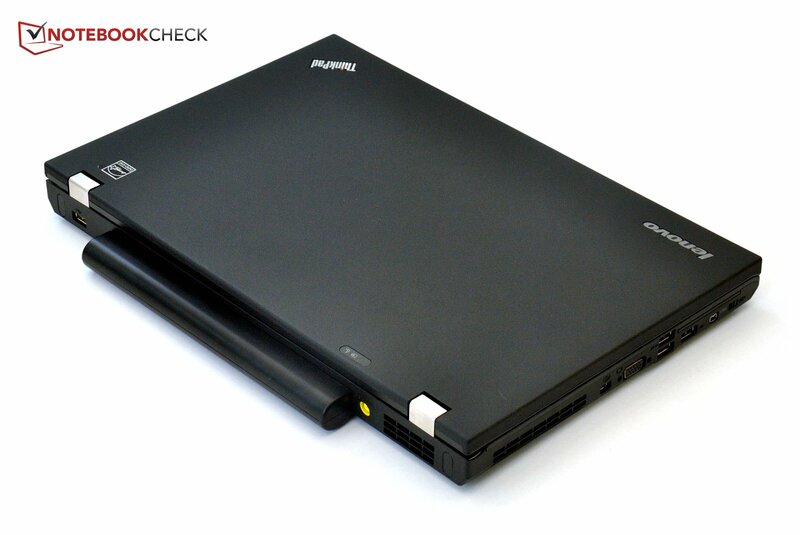 In addition, the two USB ports carried over from the T520 now support the USB 3.0 specification. The DisplayPort connector has been reduced to a mini DisplayPort, a change that is illogical in light of the available space for connectors. The VGA connector and its securing screw holes as well as the four-pin FireWire 400 port remain unmoved from their previous positions. For right-handed users, only the audio cable could potentially get in the way of an external mouse as almost all remaining cables are connected on the left side. As a result, left-handed users may find the Dell Latitude E6530 more comfortable as that notebook has few ports on front left side. A corresponding docking station may prove helpful when multiple ports are used extensively. 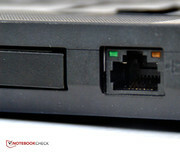 While the modem connector on the rear has been removed, it remains easy to connect to the Internet and other devices easily using the included wireless technologies. An optional Ericsson H5321gw HSPA+ (Evolved High-Speed Packet Access) card is available for an additional 80 Euro ($99 USD). 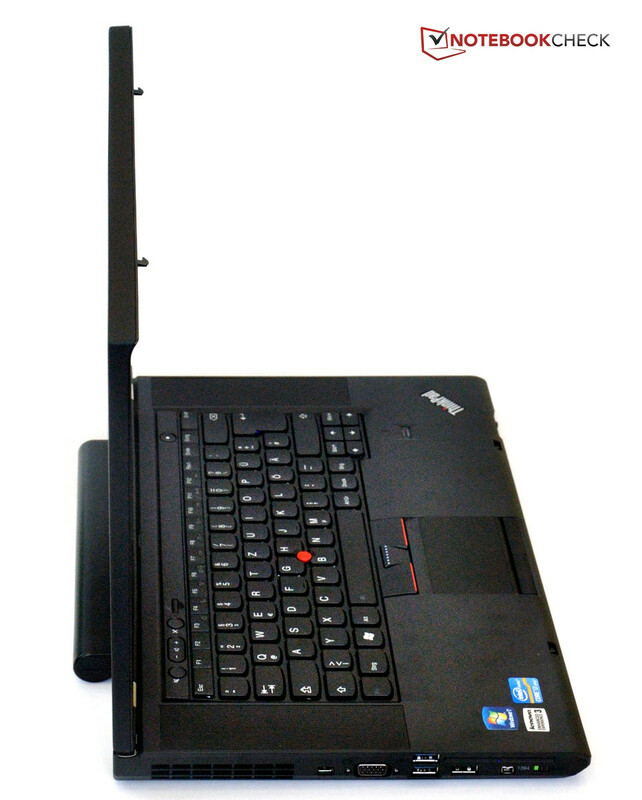 The Intel 82579LM Gigabit Ethernet controller allows the ThinkPad T530 to connect to a wired LAN. Bluetooth 4.0 is also available. For the Wi-Fi card, the buyer can select one of three options. 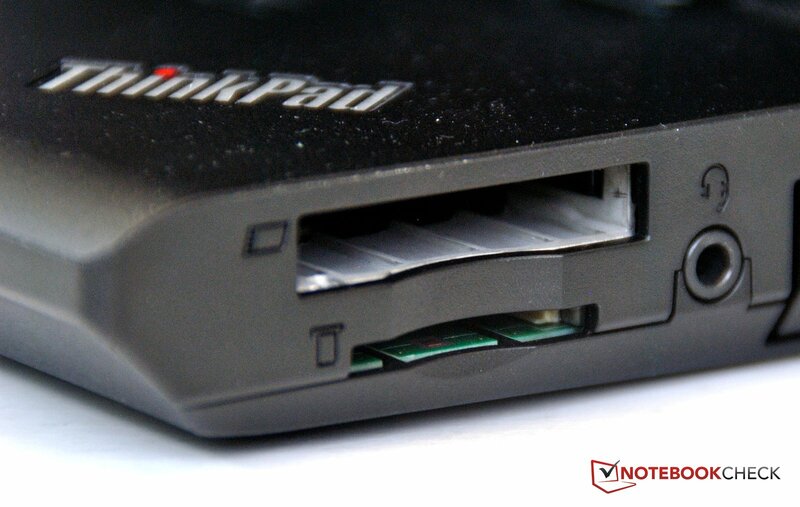 The standard option is Lenovo’s ThinkPad b/g/n adapter that supports the IEEE 802.11b/g/n protocols. The second option costs 15 Euro ($19 USD) and equips the ThinkPad T530 with the Intel Centrino Advanced-N 6205 and two antennae. The third option is the Intel Centrino Ultimate-N 6300 which has three antennae and adds a 40 Euro ($49 USD) premium. 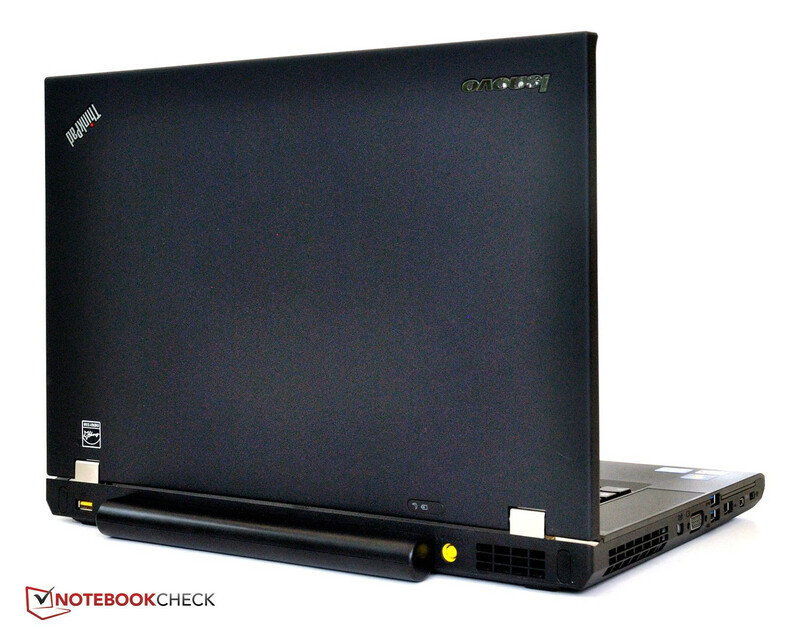 The ThinkPad T530 includes typical security features. 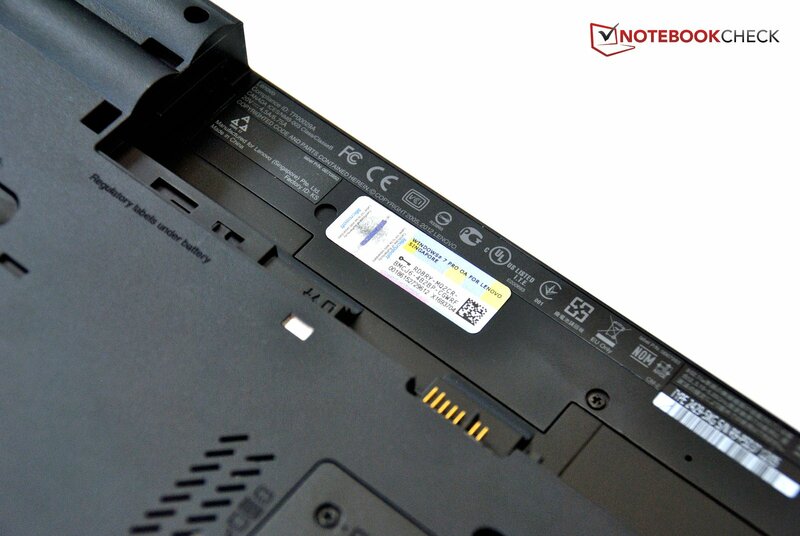 A BIOS password, Trusted Platform Module (TPM), and fingerprint reader protect against data theft and are standard features for most business notebooks. 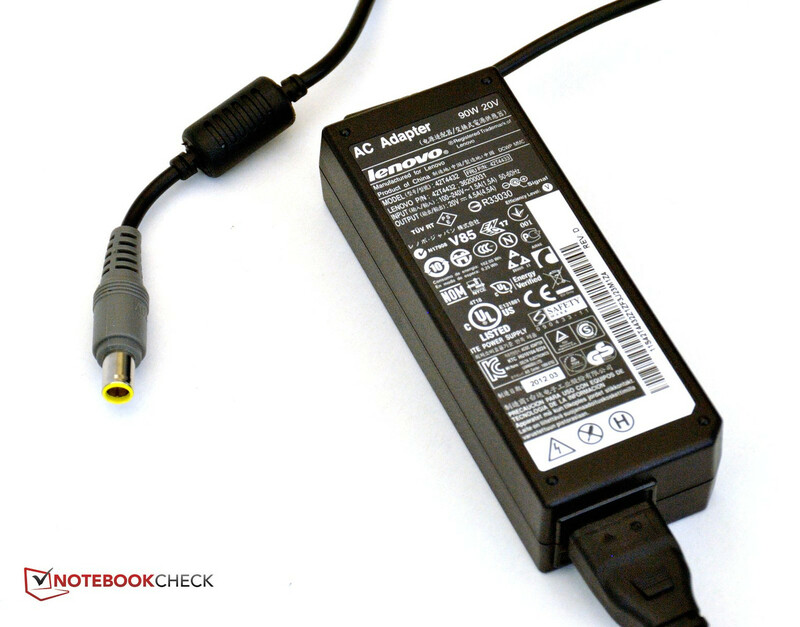 The ThinkPad T530 does not include any accessories and only comes with the power supply and battery. Nonetheless, a wide array of optional accessories is available from Lenovo and we will describe them here. 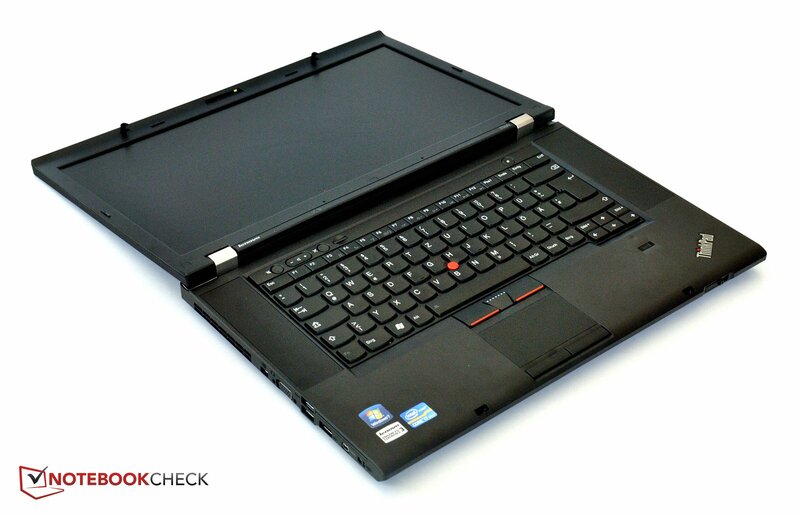 Virtually all parts from the previous T520 series are compatible with the new ThinkPad T530 due to the similar case. 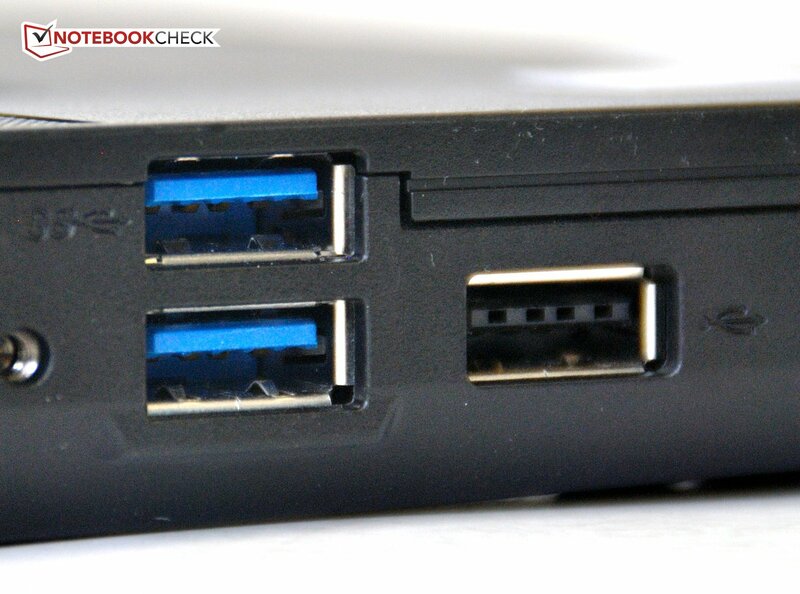 Other USB 3.0 accessories may be required. 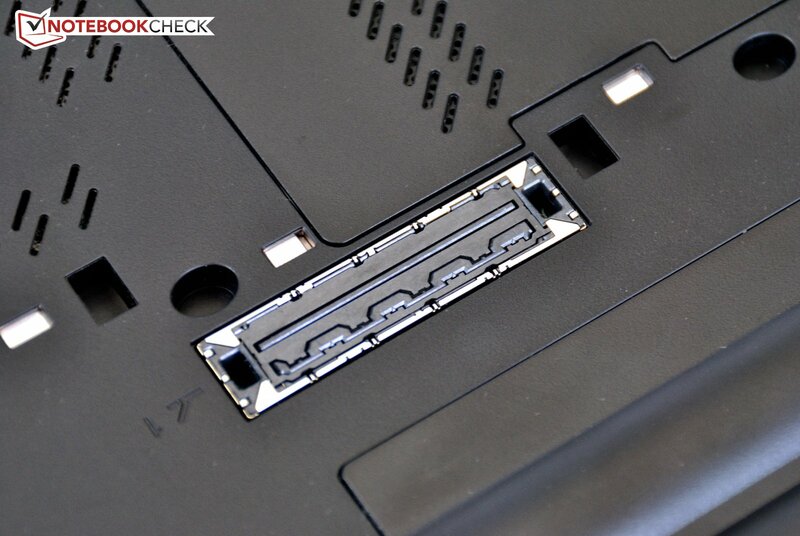 The ThinkPad T530 can be connected to two different docking stations via the built-in docking port on the underside. The Series 3 port replicator has USB 3.0 support and is available for 110 Euro ($135 USD). This docking station does not add many additional ports and only offers three USB 2.0 ports, one USB 3.0 port, a VGA port, and a Gigabit LAN port for desktop use. The Series 3 Mini Dock Plus is available as well for just under 230 Euro ($280 USD) and also has USB 3.0 support. This docking station provides the same as the port replicator as well as an additional three USB 2.0 ports, two DVI ports, two DisplayPort connectors, and two audio jacks for simultaneous headphone/speaker and microphone use. Beyond the docking stations, a mini DisplayPort-to-VGA adapter is available. Considering the built-in VGA port on the notebook, its usefulness seems quite limited. Third-party adapters may be required for other connectors such as DVI, HDMI, and DisplayPort. While third-party adapters may not match in style, they could be considerably cheaper. 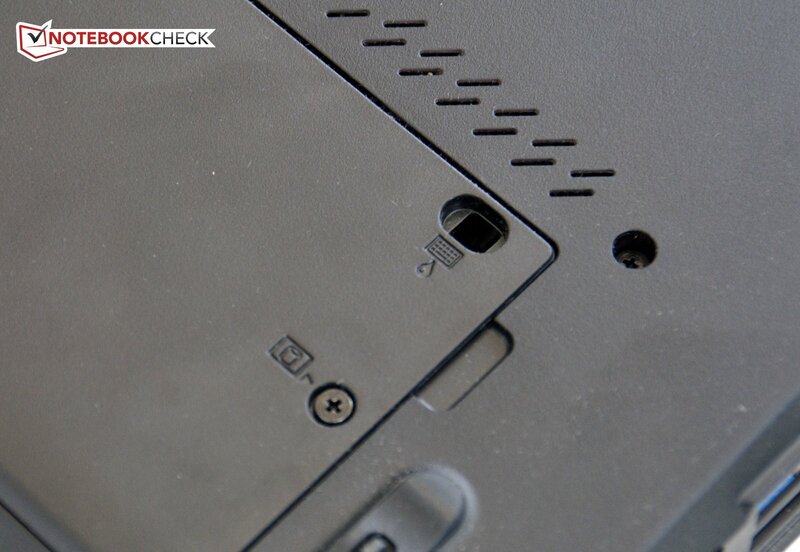 The ThinkPad T530 has two maintenance covers on the underside. The hard disk is underneath the first cover and the second RAM slot is found under the second. Lenovo allows the user to exchange or replace the following parts without voiding the warranty: Wi-Fi Card, WAN card, hard drive, keyboard, TrackPoint, and RAM. 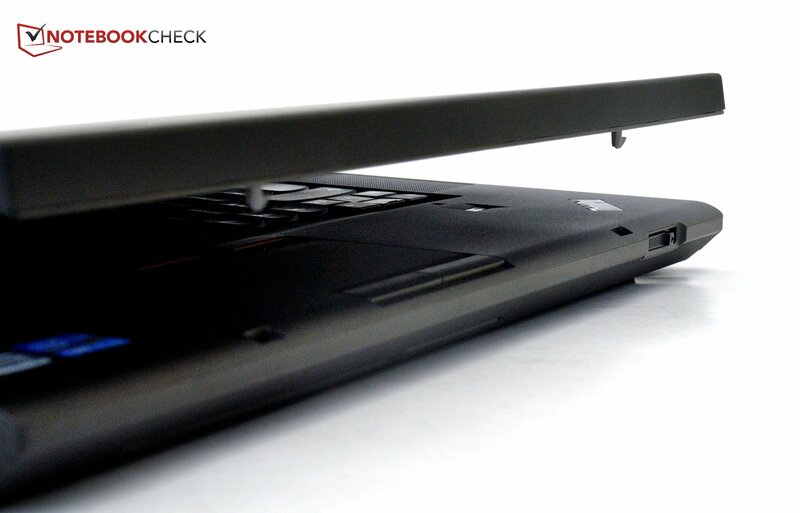 The ThinkPad T530 comes with a standard three-year carry-in warranty. This warranty can be expanded to include on-site next business day service including accidental damage protection for 200 Euro ($245 USD). 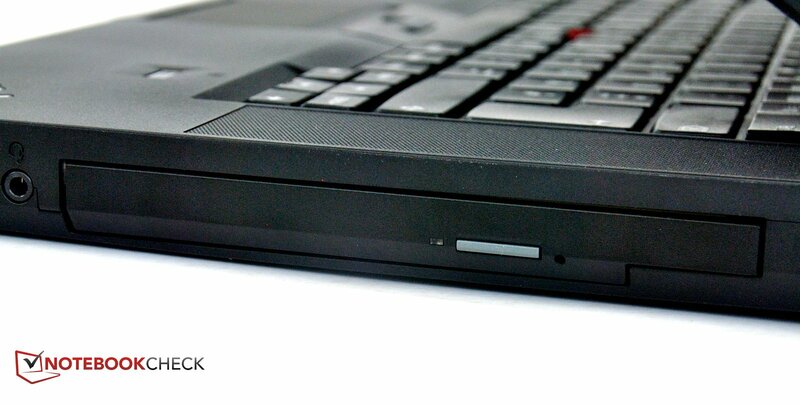 The most noticeable change in the ThinkPad T530 is the keyboard. Both the design and layout have been adjusted. 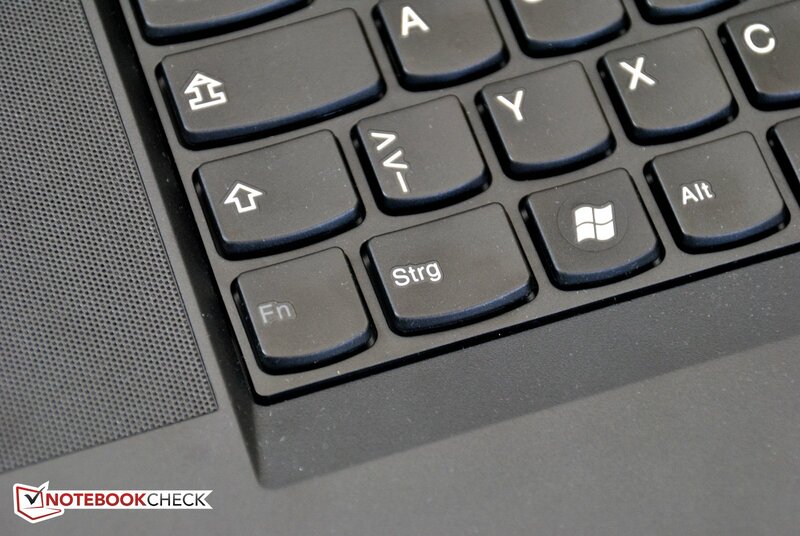 In terms of design, the keyboard is now a chiclet-style interface and the keys are separated by a crosspiece. According to Lenovo’s advertising information, this style is known as “island style”. The keys of the top row and the arrow keys are flat but the space bar is convex and curved outward. All other keys are concave and curved inward. As a result, fingers tend to hit key centers accurately. The color of the keyboard has also been changed to an extent. The blue that once highlighted special keys such as the Enter key has now been replaced by a consistent black and these keys no longer stand out. The keyboard layout has also been revised. Although the Fn key and Ctrl key remain reversed when compared to other notebooks, the right front area has been significantly modified. The Print key has replaced the context menu key which has now been completely removed. The PgUp and PgDn keys are now above the left and right arrow keys. The Esc key is now only half-sized and the Del key has been moved to the upper right corner. The Ins, End, and Pos1 keys are located beside the Del key. The Scroll Lock and Pause keys have also been removed. Unfortunately, there is still no number pad, something that would be useful for data entry. The ThinkLight, a small LED light beside the webcam, is again available. A backlit keyboard is also optionally available. The keyboard remains splash proof. 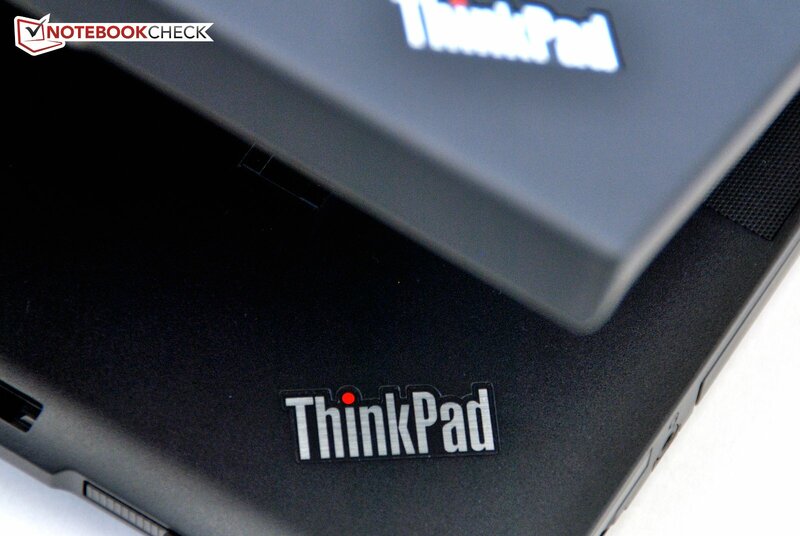 The Touchpad and TrackPoint have remained unmodified since the ThinkPad T510. 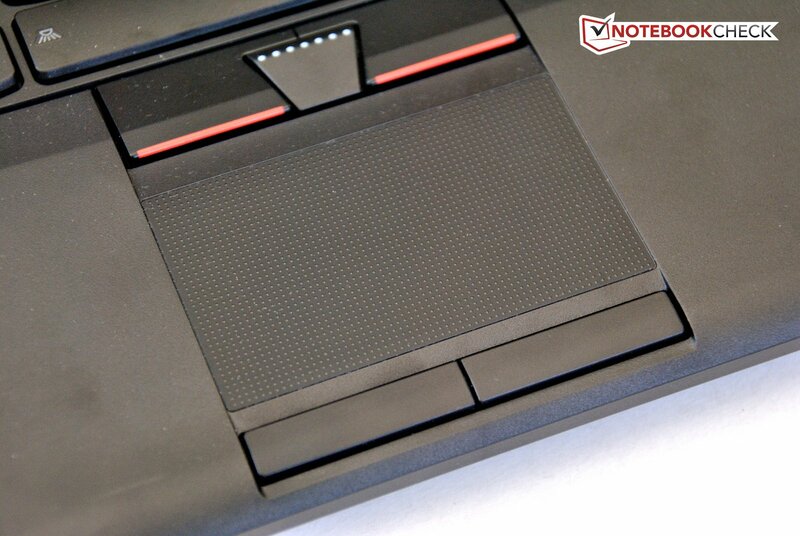 As a result, the Touchpad is no longer standard sized but is considerably smaller than other current notebooks. 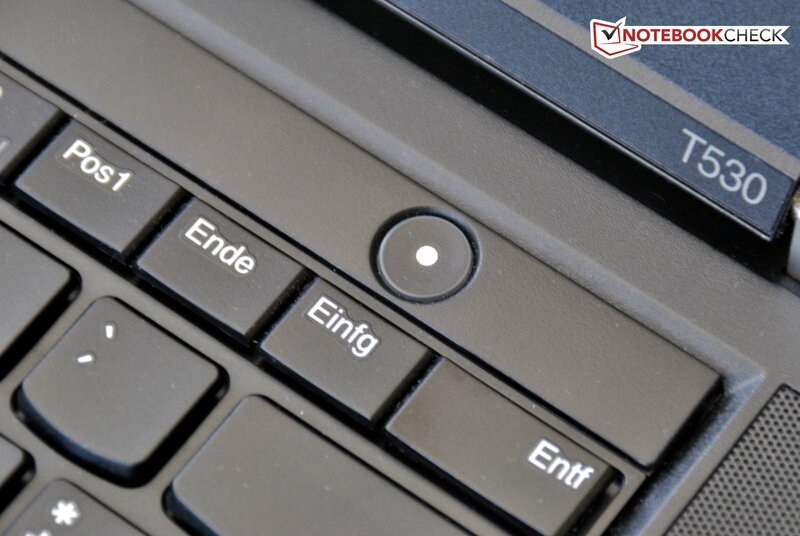 While it supports multi-finger gestures, the HP EliteBook 8570p features a much larger touchpad by comparison. For the ThinkPad T530 family, one can choose between three 15.6-inch matte screens. The cheapest screen uses an HD WXGA resolution of 1366x768. The two more expensive screens offer higher 1600x900 HD+ and 1920x1080 Full HD resolutions. The latter has a higher brightness and larger reproducible color spectrum. 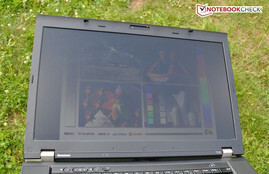 A review of this brighter Full HD display will be included in the upcoming ThinkPad W530 review. Our test sample uses the AU Optronics B156RW01 1600x900 HD+ screen. In the specification sheets, Lenovo specifies that this display has a screen brightness of 220 cd/m2. We measured an average brightness of 219.9 cd/m2, virtually identical to the advertised specification. The maximum measured brightness of 230 cd/m2 was found on the right. The darkest measured spot of 207 cd/m2 was found in the upper right corner. An overall illumination of 90 percent was measured and is far above average. Full brightness is available on battery power. We measured a very low black value of 0.33 cd/m2, better than those of most competitors. Combined with the good measured brightness, we determined a contrast ratio of 673:1. This not only reproduces saturated, vivid pictures and movies but also increases the legibility of text. The previous ThinkPad T520‘s screen had a similar contrast but the illumination was much worse and the screen itself was overall darker. 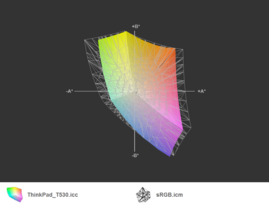 We observed that neither the sRGB nor AdobeRGB color spectrum was close to being covered. 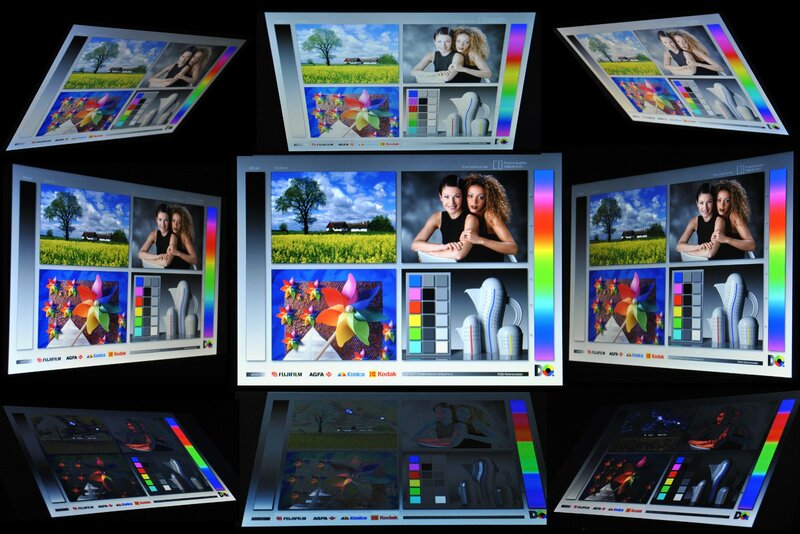 For those seeking better color reproduction, we recommend the Full HD screen that is capable of significantly more color. 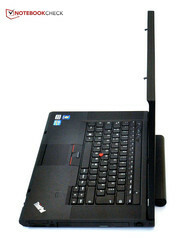 More about this screen can be found in the review of the ThinkPad W530. 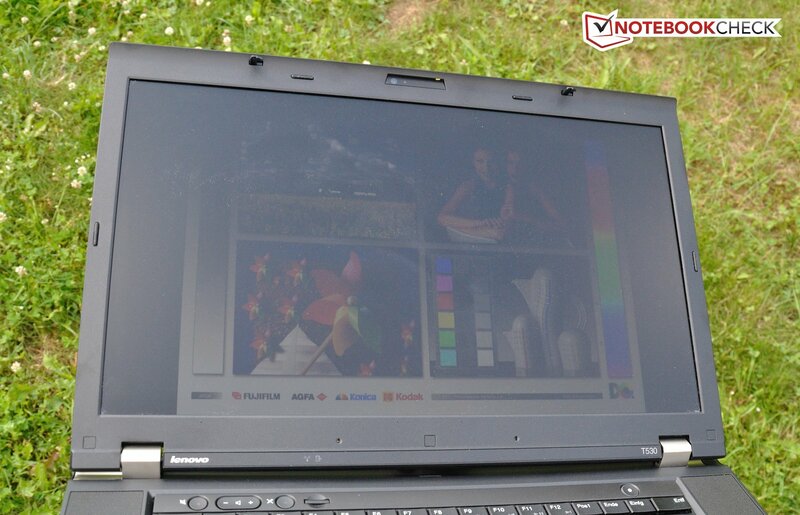 The matte screen serves the ThinkPad T530 well in outdoor situations. While glare-type screens typically reflect their surroundings in bright sunlight, the T530 avoids annoying reflections. With its sufficient brightness, the T530 allows users to work well even in bright surroundings. The observed viewing angles are close to the limit for the target price. Most content remains well-rendered at horizontal deviations from head-on albeit with significant brightness reduction. On the other hand, when viewing the display from below head-on, text remains legible but color distortion is significant and dark colors turn to black or dark gray. When viewing from above head-on, colors appear a bit worse and darker but the display’s contents remain recognizable. 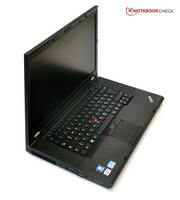 The ThinkPad T530 can be configured in innumerable ways via the online Lenovo store. Merely the choice of processors is already enormous. The weakest option is the second generation Sandy Bridge Core i3-2370M. An equally clocked third generation Ivy Bridge Core i3-3110M is also an option. Three Ivy Bridge Core i5 CPUs are also options – the i5-3210M, i5-3320M, and i5-3360M. Lastly, three Ivy Bridge Core i7 CPUs are also available – the i7-3520M, i7-3610QM, and i7-3720QM. If none of these processors are sufficient for the task at hand, the ThinkPad W series allows one to choose Intel’s flagship mobile processor, the Core i7-3920XM Extreme Edition. Depending on the choice of CPU, the ThinkPad T530 will have either the Intel HD Graphics 3000 GPU for the Sandy Bridge CPU or the Intel HD Graphics 4000 for Ivy Bridge processors. For those seeking the power of a dedicated graphics card, it is possible to include the Nvidia NVS 5400M. The NVS 5400M features 1 GB of dedicated VRAM and takes over for the HD Graphics GPU in real-time thanks to Nvidia Optimus technology. Another configurable option is memory, which allows the buyer to select 4, 6, or 8 GB of RAM. Upgrading the memory pool to 16 GB is easily achievable by the buyer. In terms of storage devices, the buyer can choose hard drives in both 5400 and 7200 RPM (rotations per minute) speeds and with capacities of up to 500 GB. Faster solid state drives (SSDs) are available in 128, 180, and 256 GB capacities. Our test sample features the third generation Ivy Bridge dual-core Core i7-3520M processor, built using the 22 nm fabrication process. This processor has a base clock speed of 2.9 GHz but can reach single core Turbo Boost speeds of up to 3.6 GHz. To test the CPU’s performance, we used the Cinebench R11.5 64-bit Multi-CPU test and rendered a 3D scene. 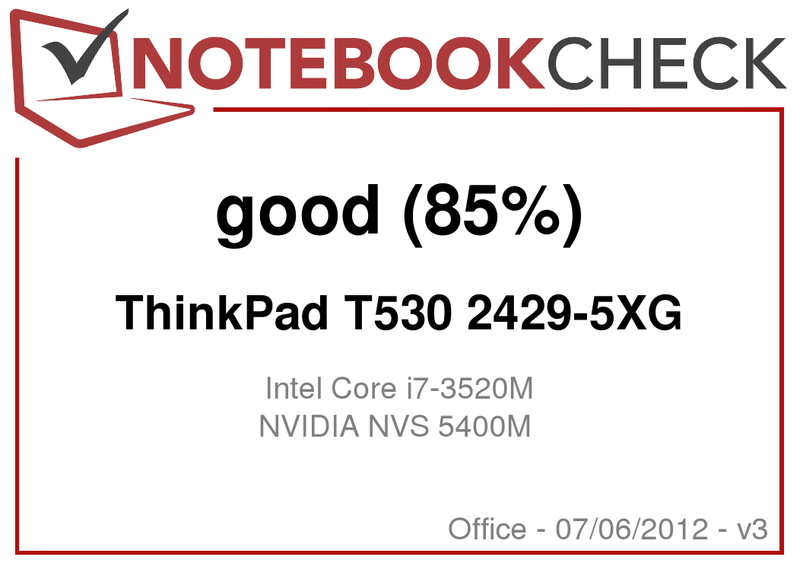 Our ThinkPad T530 reached 3.36 points as the Core i7-3520M bridges the gap between the weaker dual-core Core i7-2640M’s 3.15 points and the much stronger quad-core Core i7-2630QM‘s 4.40 points. 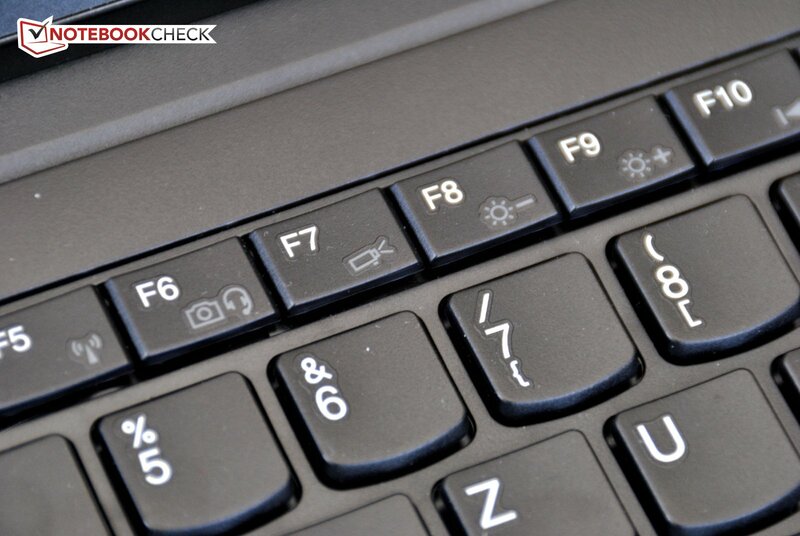 We assessed the notebook’s overall performance using PCMark 7. This suite of tests runs multiple applications and determines a score based on the average performance achieved in each test. Due to the strong dual-core CPU and dedicated graphics card, our test sample managed quite a bit of performance and placed itself in the upper midfield. The lack of an SSD prevented the system from reaching a higher tier of performance. 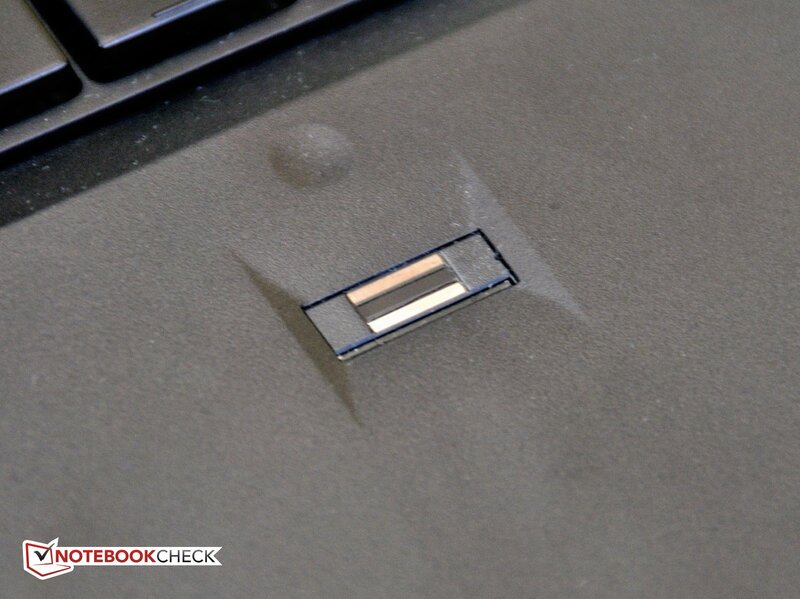 Our test sample uses a 7200 RPM Hitachi Z7K500 500 GB hard drive which only has one platter. Due to its 7200 RPM speed, this class of drive typically requires more power and is louder but also provides a higher data throughput. 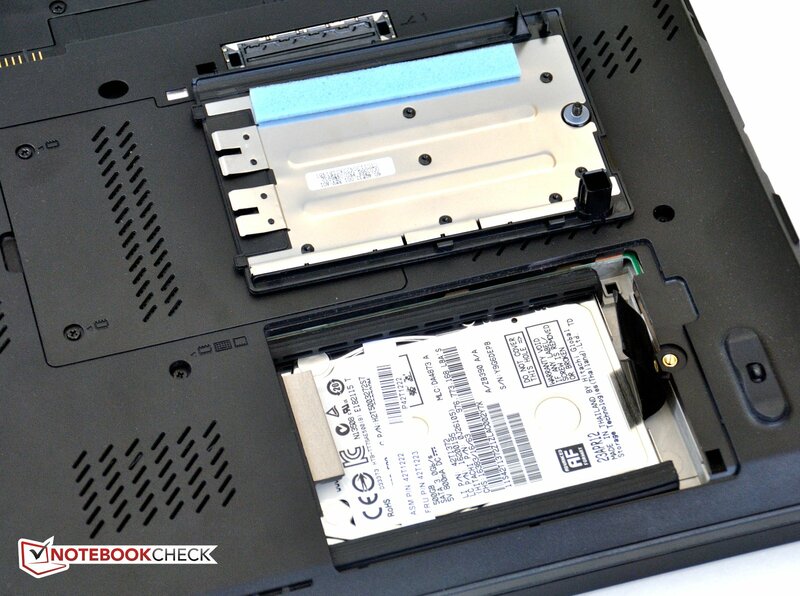 Although the ThinkPad T530 has room for a larger hard disk, Lenovo chose to install a 2.5-inch drive with a build height of only 7 mm (0.28 in). In our tests, the hard drive achieved almost 120 MB/s in sequential reads and 115 MB/s in sequential writes, demonstrating the disk’s good read and write speeds. These results place the drive in the neighborhood of low-priced SSDs for larger file access. Naturally, a physical disk cannot achieve the very short access times of any flash-based SSD, regardless of the price. For graphics, our ThinkPad T530 features two GPUs. The weaker, processor-integrated Intel HD Graphics 4000 is more than sufficient for less demanding tasks and can handle HD video playback. Due to its energy-efficiency, the HD Graphics 4000 allows the system to run on battery power for longer than a dedicated graphics card would. When graphical demand increases, the ThinkPad T530 can automatically switch to the dedicated Nvidia NVS 5400M using Nvidia Optimus. As a business graphics solution based on the GeForce GT 630M chip, business applications such as CAD/CAM (computer-aided design, computer-aided manufacturing) run particularly stably due to special drivers. In 3DMark11, we found that the NVS 5400M is approximately comparable to the AMD Radeon HD 6650M and a bit weaker than the Nvidia GeForce GT 630M. The latter outperforms our NVS 5400M despite being based on the same chip as the drivers for the GT 630M are optimized for gaming instead of business. Nonetheless, the ThinkPad T530’s suitability for CAD applications remains limited. Those seeking serious construction or design tasks should consider the ThinkPad W Series. The ThinkPad T530 is not designed for gaming. We were able to play all current games in low or occasionally medium settings, but the low graphics quality ruined the experience. As the GPU is not optimized for computer games, the NVS 5400M has a slightly lower ranking than the GeForce GT 630M that is based on the same chip. 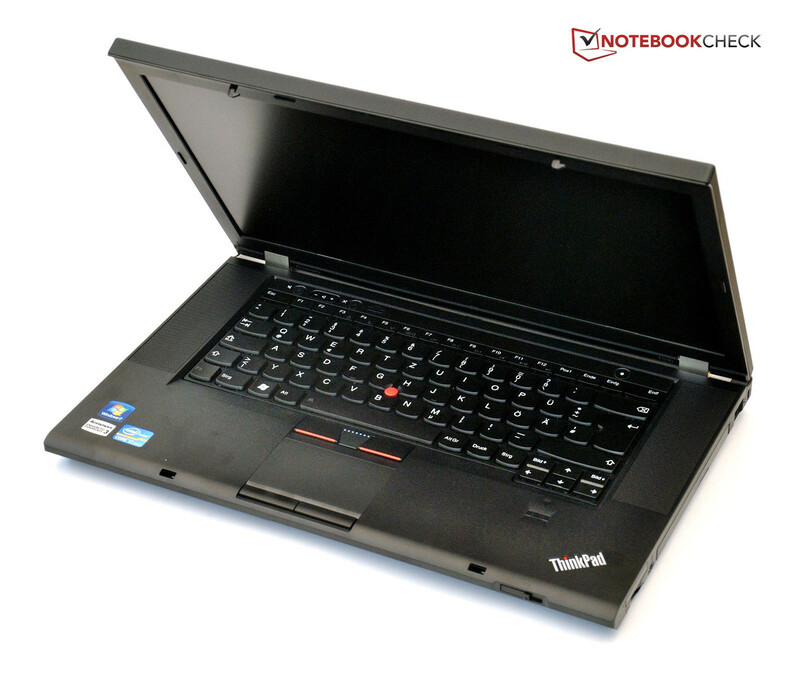 Similar to the previous ThinkPad T520, the ThinkPad T530 remains pleasantly quiet. While idle, the system emitted a barely audible 31.4 dB(A). During office use, the hard disk, which is a bit louder than the fan, was occasionally heard with a noise level of 32.6 dB(A). In this scenario, the T530 is more or less unobtrusive. The DVD drive was a bit louder, but still very quiet with a noise level of 33.9 dB(A). During load, the fan speed increased and the ThinkPad became clearly audible at 37 dB(A) but we felt this level was not disturbing due the fan’s consistent speed. In terms of temperatures, the ThinkPad T530 did not score as well. While idle, the underside of the T530 reached nearly 40oC (104oF). This is very close to the feasible limit for lap-top use. The top of the notebook stayed within an acceptable range with a maximum temperature of 35oC (95oF). During the extreme load of our simultaneous CPU/GPU stress test, the ThinkPad heated up particularly in the vent area on the left side and both the top and bottom of the unit reached a high 53oC (127oF). The left wrist rest did not remain particularly cool with a measured temperature of 39oC (102oF). The previous ThinkPad T520 did much better in terms of heat management and did not even reach 40°C (104oF) during load. In our stress test, we checked to see if CPU and GPU performance remained available over longer periods of full load. At first, it seemed that the T530 coped well as it was able to run at its full 3.4 GHz Turbo Boosted speed for the first hour. Once the CPU temperature climbed to over 100oC (212oF), the CPU clock immediately dropped to 1.2 GHz and remained there until the core temperature dropped to below 80oC (176oF). In 3DMark06, the ThinkPad was able to reach full power, suggesting that overheating is very unlikely in normal use. While the ThinkPad’s speakers take up a lot of space in this implementation, the speakers themselves do nothing beyond the typical quality of business notebooks. They have an adequate volume, but music sounds hollow due to the complete lack of bass. We observed highly variable power consumption depending on application. While idle in energy saving mode with the Wi-Fi module disabled and the screen dimmed to minimum brightness, the ThinkPad T530 consumed 9.5 Watts. This result is 2 Watts higher than its preceding T520. With Wi-Fi enabled and maximum screen brightness, the ThinkPad T530 consumed 14.1 Watts while idle in high-performance mode. This is exactly 2 Watts less than the previous T520. However, during load the ThinkPad T530 once again consumed more power than its predecessor. The T530 consumed approximately 5 Watts more during the stress test due to the T520’s weaker components – Core i5-2410M versus Core i7-3520M and NVS 4200M versus NVS 5400M. The measured maximum consumption of 82 Watts is acceptable for a workstation. The included 90 Watt power supply should be capable of handling this consumption, but we observed battery drain during our CPU / GPU load test. 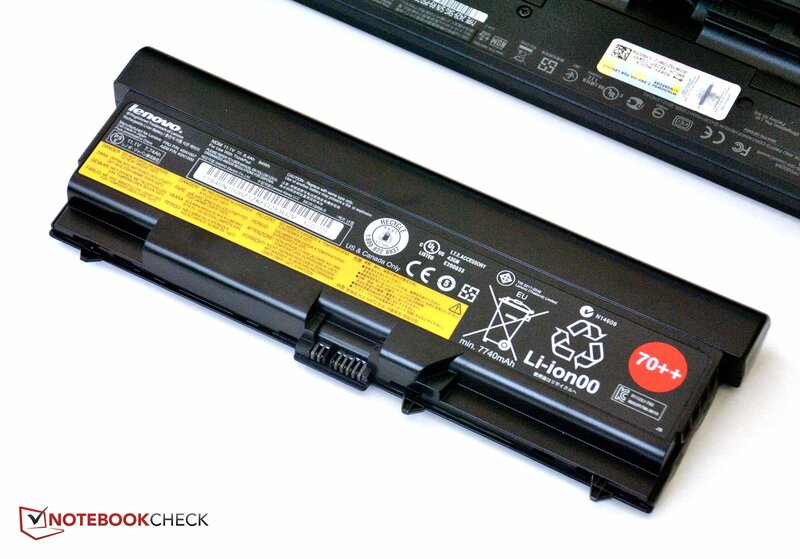 As with other aspects of the ThinkPad’s configuration, several options are available for the battery. 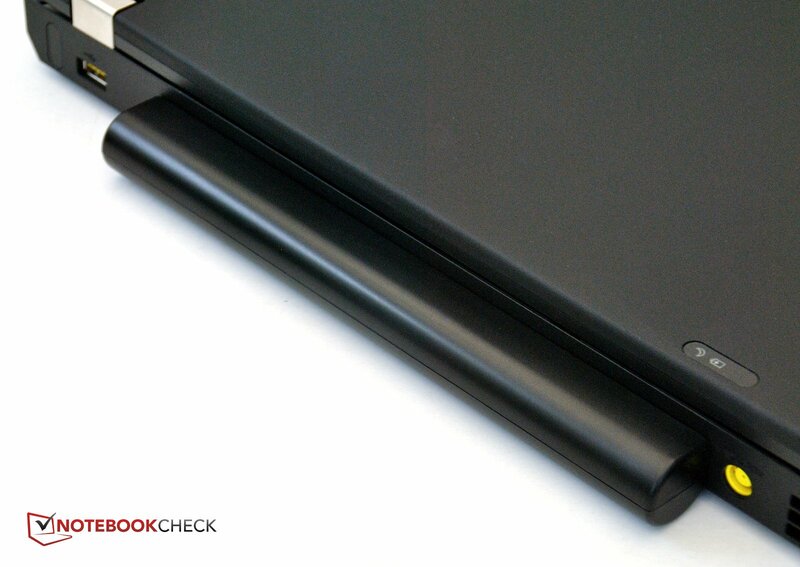 The 6 cell battery lays flush with the ThinkPad’s case. For a 20 Euro ($25 USD) premium, the 9 cell battery clearly extends out of the rear. 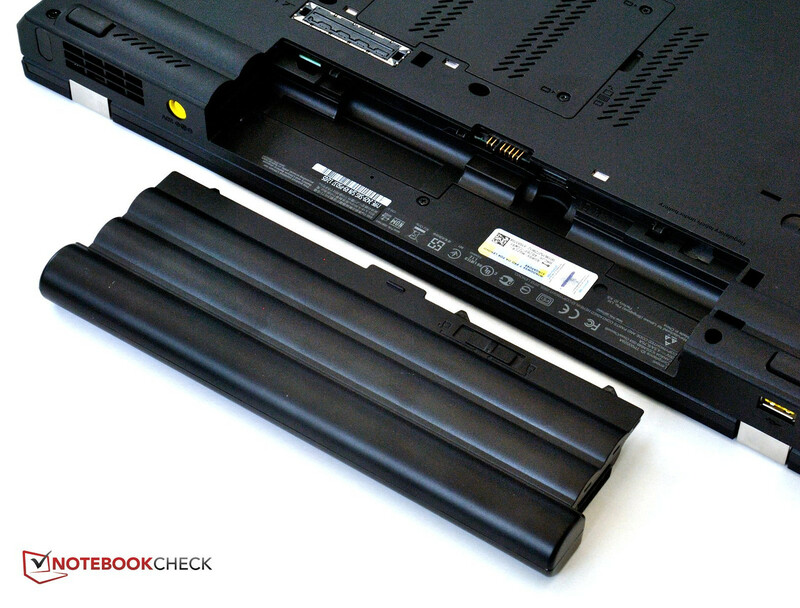 There is also the option of using another 9 cell battery that connects to the ThinkPad’s underside via the docking port. Our test device uses a 9 cell battery with a rated capacity of 94 Wh. In the Battery Eater Reader test, with minimum screen brightness and Wi-Fi disabled, we achieved a maximum runtime of 10.5 hours. The more realistic Wi-Fi surfing test, with a screen brightness of 150 cd/m2 and Wi-Fi enabled, uses Internet surfing as the load and our ThinkPad sample lasted a remarkable 8 hours in this test. We tested the ThinkPad’s endurance by watching DVD movies and measured a runtime of 5.5 hours, more than enough for even two extended cut movies. In the Battery Eater Classic test, we rendered a moving 3D scene with Wi-Fi enabled and maximum screen brightness, representing a worst case scenario. In this test, our notebook only lasted about 2 hours. The processor’s performance remained at the same level as on AC power. The GPU was a bit weaker and only scored 9033 points in 3DMark06 as compared to the 9215 points on AC power. The ThinkPad T530 demonstrated a 3 hour recharge time. 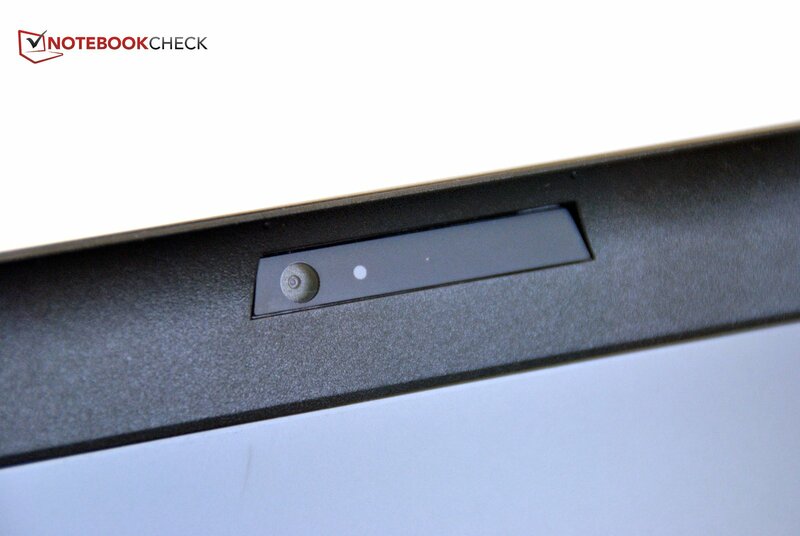 Lenovo clearly wants its ThinkPad line to take a step forward. While the notebook’s basic design was left untouched, the very familiar keyboard was completely revised and adapted to current trends. Regular Lenovo customers will need a while to get used to the new layout. Both the touchpad and TrackPoint were unchanged. On the positive side, the keyboard now has a backlight. Otherwise, most things remain unrevised. The black plastic and magnesium case is rigid. Unfortunately, the battery is a bit loose in its compartment. Since the design has not been modified, almost all accessories can still be used. 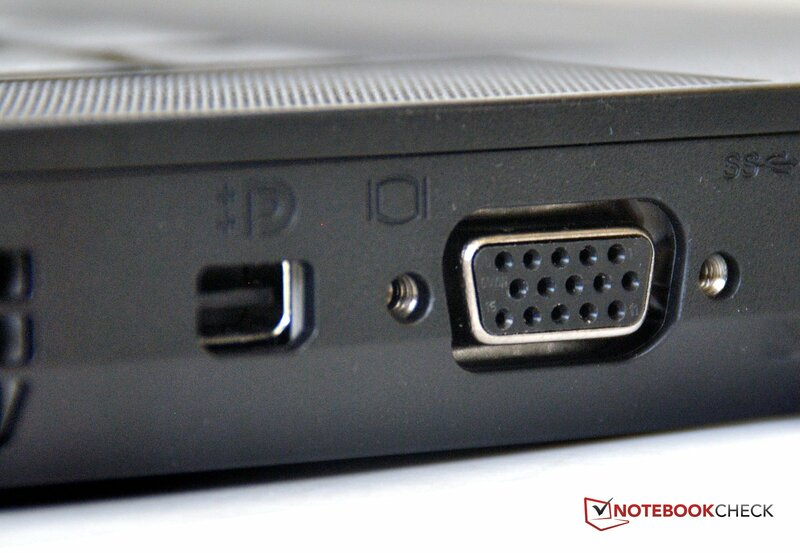 One area of upgrade is the two USB 3.0 ports that the ThinkPad 520 did not have. However, Lenovo should not have reduced the total number of ports and should have installed two more USB ports. For those requiring more interfaces, a docking station can be connected via the docking port on the underside. Communication is once again state-of-the-art. The notebook can connect to other devices and the Internet via IEEE 802.11b/g/n Wi-Fi, optional HSPA+, and Bluetooth 4.0. The only reduction in this regard is the removal of the modem port. 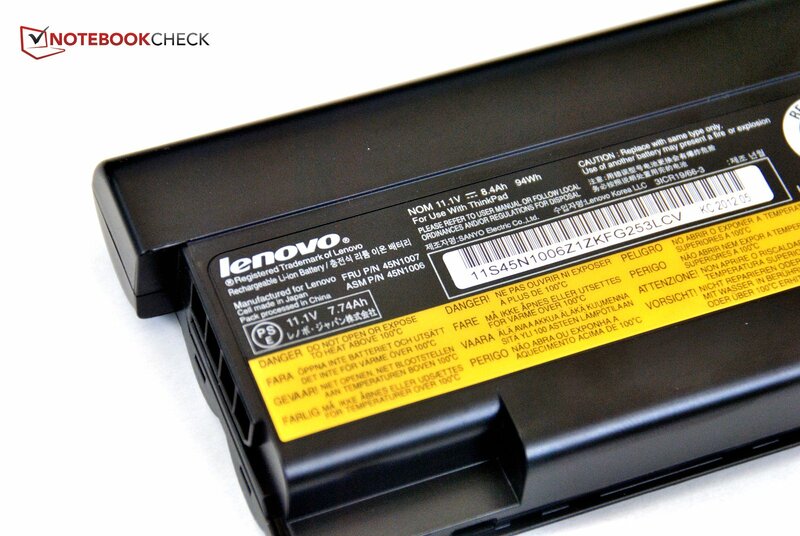 Lenovo continues to give customers many possibilities for maintenance and upgrades for the ThinkPad. Lenovo also clearly specifies what the user is allowed to modify without voiding the warranty. The 1600x900 HD+ screen on our test device had a good average brightness of 220 cd/m2 and very good contrast. These allowed the notebook to be used outdoors when combined with the screen’s anti-reflective coating. The reproducible color spectrum remains on a consumer level and viewing angles could also be a bit better. Our device uses the currently fastest Intel dual-core processor. It is supported by the Nvidia business graphics card, NVS 5400M. 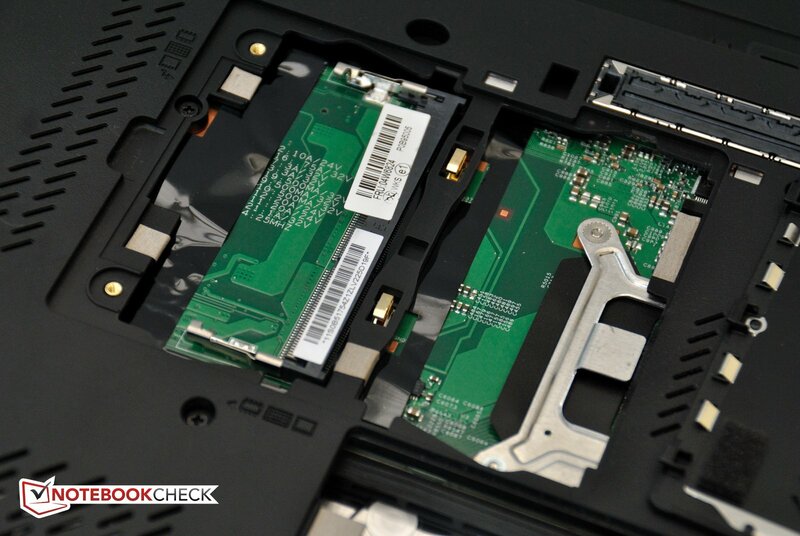 With the fast 500 GB hard disk in our system, our ThinkPad T530 was capable of good everyday performance. However, the system is too weak for games and sophisticated CAD. The ThinkPad stayed pleasantly quiet, but became very warm. Despite a CPU temperature of up to 100°C (212oF), full performance can maintained for a long time. The battery life was good thanks to the large battery and is beneficial for a work device. 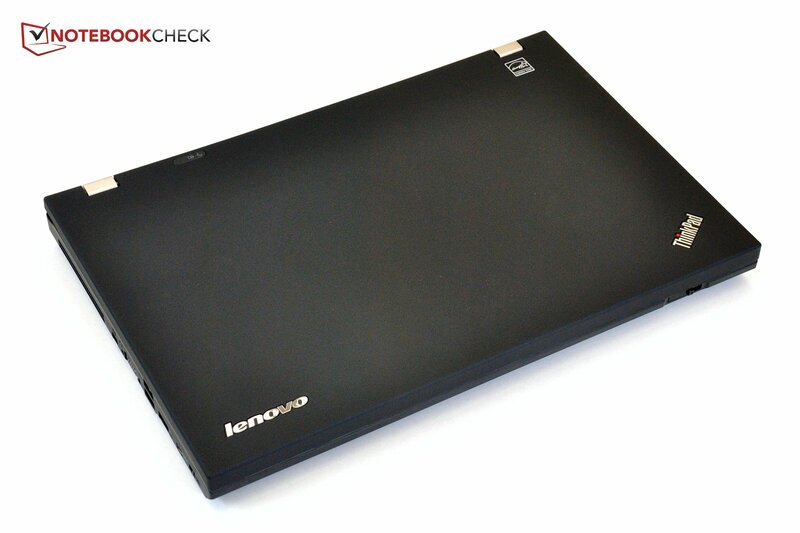 Overall, Lenovo has created a good business notebook for 1500 Euro ($1830 USD). A few point deductions were made due to heat issues and the wobbly battery, but the ThinkPad T530 is a worthy successor for the T Series. However, each user will have to decide if he or she likes the new keyboard. and clearly juts out of the rear. although not sufficient for games or CAD. The docking port is on the underside. FireWire 400 is still supported. USB 3.0 is new for the ThinkPad line. Unfortunately, there are only two. External monitors can be connected via mini DisplayPort or VGA. The power supply port is next to the big battery. The latch is unfortunately a bit loose. The 90 Watt power supply is barely enough. One RAM slot is still empty. A fast, 500 GB Hitachi hard disk is installed. but is fastened by only two rubber caps. The hard disk has its own slot. Maintaining the ThinkPad is fairly simple. Windows' license sticker is underneath the battery. 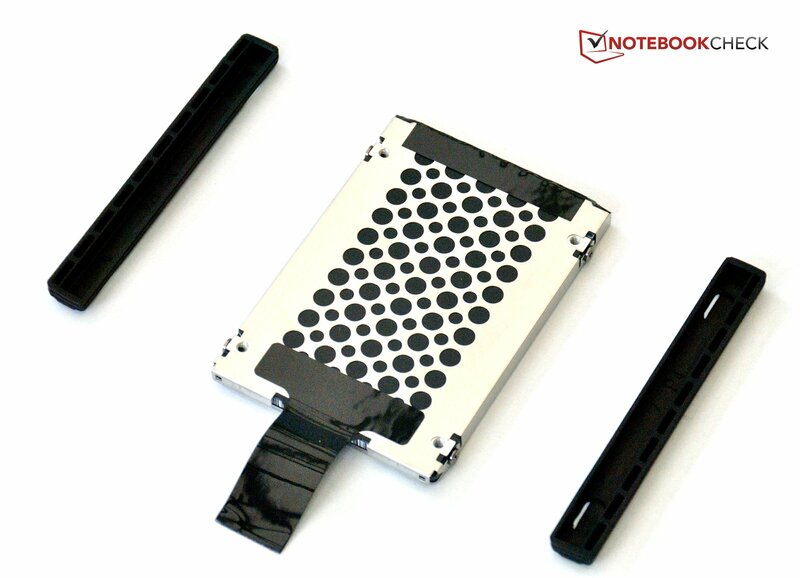 an additional one can be connected to the notebook's underside. One USB 2.0 is permanently powered. Gigabit LAN is on the rear right. ExpressCard 34 and card reader are still found on the right. 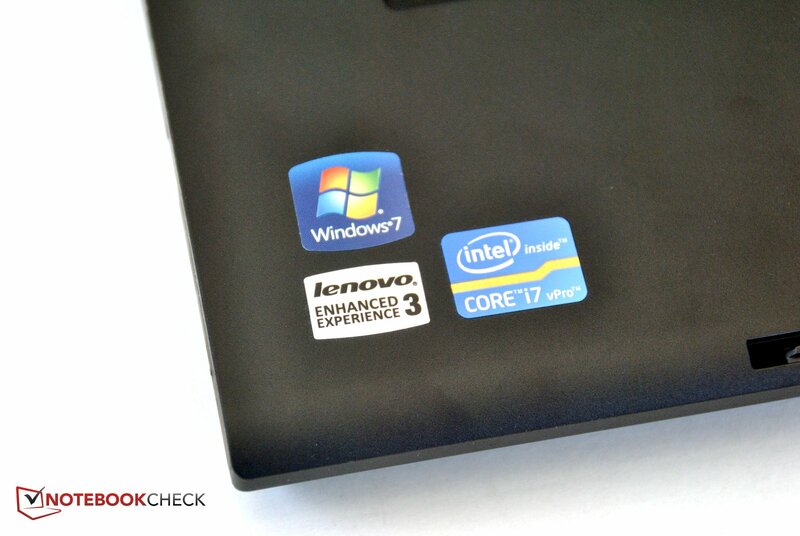 Lenovo has dared to make one major modification. The ThinkLight lights up in the dark. and the hinges are stable. The familiar hooks secure the display lid during transportation. At first glance, everything appears unchanged. The familiar keyboard has been replaced. Slight changes are found in connectivity. and replaced by something else. A webcam can be built in for 10 Euro ($12 USD). The warranty covers a three year period. The matte HD+ screen is bright and has a good contrast. The good workmanship and the quiet, restrained impression. A better fitting battery and more USB 3.0 ports. The dual-core processor's high performance.